I’ve heard plenty of talk about Cam and if or when he is going to flop or when teams are going to pick up on what he’s doing. Folks, please don’t be distracted by the big numbers. He is the real deal. It’s not that he can throw for 20+ yards a play. It’s not that he can run the ball when he wants. Those things help, but they are just icing on the cake. He is a leader. He sets the example for the rest of the team and it’s up to them to respond. When something needs to happen, Cam does what needs to be done. Unfortunately, winning the game hasn’t been the most successful venture so far, but he still has a lot to learn. What he does do when he takes snaps is something that will resonate through many seasons after this one. Every bit of Cam’s 6-5, 248 lbs stature is speaking loads about what he brings to the table. Let’s take it back to his Auburn days when all we knew about him was that he was an athlete and he worked well in the spread offense. Physically he can compete with the likes of Ben Roethlisberger. Running wise he acts as a Michael Vick or a Vince Young. These factors alone make him an advantage that the struggling Panthers could use in a run first offense. Now that we know he can throw, he becomes more of a Phillip Rivers or a Matt Ryan. Emulating any of these quarterbacks is enough to get at least 200 passing yards a game and almost 50% of converted 3rd down attempts. On average the Panthers posted 119 yards per game with Jimmy Clausen at the helm and struggled to make any first downs let alone a 3rd down conversion when needed. Even if Cam wasn’t as good of a passer as these guys he still would have the ability to make more out of a botched play than Clausen. If he hadn’t thrown for over 400 yards in the first two weeks he would still be an upgrade at QB for the Panthers. Of course after last season, almost anyone would have been an upgrade. What Panther fans want to see is a Tom Brady, Drew Brees, or a Peyton Manning type of presence behind center. So far, Cam is throwing for over 1,600 yards with 7 TDs through 5 games. It is not possible as a rookie to make these numbers unless you are adapting to what’s happening in the game and making proper adjustments. What those QBs do well is anticipate the defense first and then decide how they want to make the play work and if the play breaks down, they are able to create opportunities that maybe weren’t there before. That is something that can only be taught through experience. What Cam has been doing is follow the play call then make a play based on what has developed. 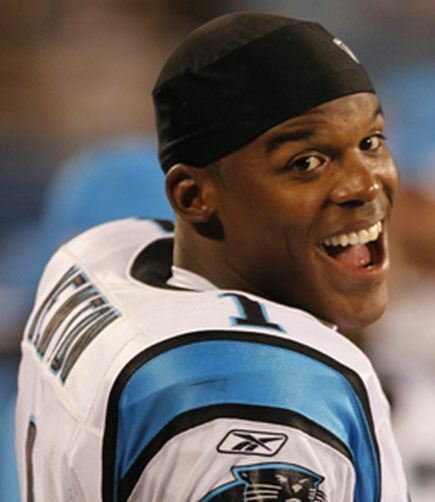 The percentage of success in this strategy is greatly reduced, but yet some of the biggest plays have come from Cam adjusting to the situation and making the best of it without having to throw the ball away. If it isn’t taught or learned through experience, it must be a natural ability that he possesses. Many quarterbacks see that there isn’t a play and do what is necessary to not get a turnover or a loss of yards. Cam neither gets sacked nor throws the ball away unless there are no other options. Usually he runs and gets some yards that other quarterbacks can’t get. This already puts him ahead of most QBs and allows him to compete with some of the best.